Grand Royal Lagoon is centrally located in Cancun, walking distance from Cancun Golf Club at Pok Ta Pok and close to Plaza Caracol Mall. 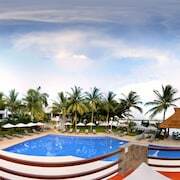 This hotel is within close proximity of Chac Mool Beach and Forum By The Sea Mall. Make yourself at home in one of the 34 air-conditioned rooms featuring flat-screen televisions. Cable television is provided for your entertainment. Private bathrooms with showers feature complimentary toiletries and hair dryers. Conveniences include safes and desks, and housekeeping is provided daily. Enjoy recreation amenities such as an outdoor pool or take in the view from a garden. Additional amenities at this hotel include complimentary wireless Internet access, concierge services, and babysitting/childcare (surcharge). Getting to nearby attractions is a breeze with the area shuttle (surcharge). Enjoy a satisfying meal at a restaurant serving guests of Grand Royal Lagoon. Featured amenities include limo/town car service, express check-in, and express check-out. Free self parking is available onsite.